Now that I'm back from SGE 2018 conference, I've put online the manuscript of my article and the slides of my presentation (in French). “Optimal management of energy systems requires strategies based on optimization algorithms. The range of tools is wide, and each tool calls on various theories (convex, dynamic, stochastic optimization...) which each require a period of appropriation ranging from a few days to several months. understand the main characteristics of each approach so we can compare them objectively and finally find the method or methods best suited to a given problem. To facilitate an objective and transparent comparison, we propose an exemplary and simple energy management problem: a solar house with photovoltaic production and storage. After justifying the sizing of the system, we illustrate the benchmark by a first comparison of some energy management methods (heuristic rule, MPC and anticipatory optimization). 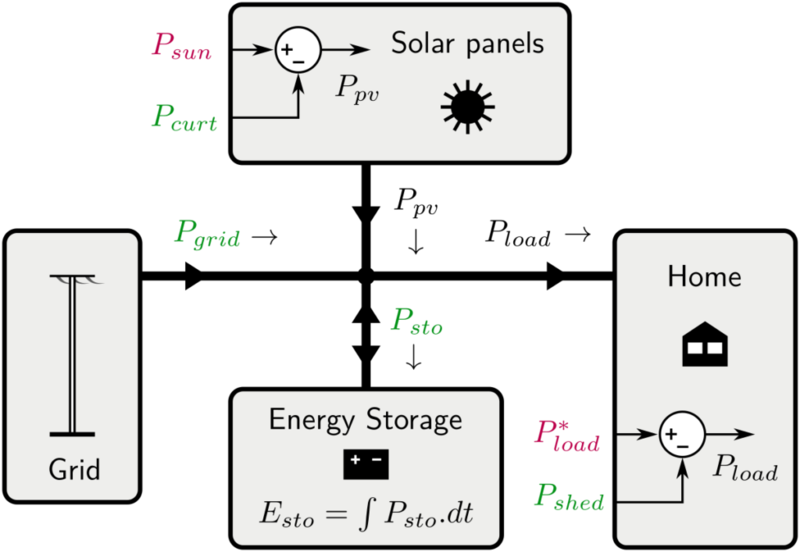 In particular, we highlight the effect of the uncertainty of solar production on performance. As of now, only rather simple energy management methods are implemented, but I'd like to add some kind of stochastic MPC (once I've clarified what this really means), and later Stochastic Dynamic Programming.